Most people, gardeners in particular, start off the new year with a bevy of bright ideas, calling them resolutions, goals, or plans. I'm not entirely completely one of those people. Of course, I do have plans. Many, many plans I'm trying not to feel overwhelmed by. But by and large, they involve many specific little mundane tasks, not an overarching Big Idea Resolution. For my garden, my primary goal isn't, for example, to construct a pond or build a pergola, it's simply to spend more time in it and enjoying it. On the teaching/presenting end, I haven't lined up a series of new speaking venues, but I am developing a new class on container gardening. Professionally, I have developed a three-pronged approach (anything with that name is inherently professional, right?) for streamlining my full-time editing job, but the specifics (don't worry, I'm not going to bore you them!) are all, um, fairly specific. And in terms of garden writing, I hope beyond hope to produce my second booklet his year, on gardening for cats. 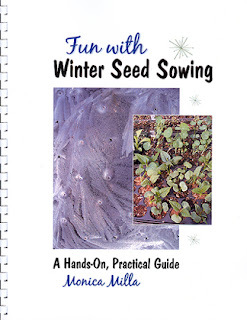 But my primary goal right now is to put together some more Fun with Winter Seed Sowing booklets, both to send out to journalists and to have a little stock pile for orders. I actually enjoy the process of making the booklets. Some might find it tedious, but there's something I enjoy about assembling the regular pages, heavier title page, and plastic front and back covers. My friend Pete has a GBC binding machine, which I have called Bindotron 2000 since he's had it, so I don't know its true model name or number. It lets me first create the holes for the pages and then it also fastens a plastic comb binder into place. I love the feel of the crisp stack of pages and the crunching sound the hole punching makes. I love how the comb is first pried open gently by the machine and then easily tucked back into shape, at the same time binding the booklet. 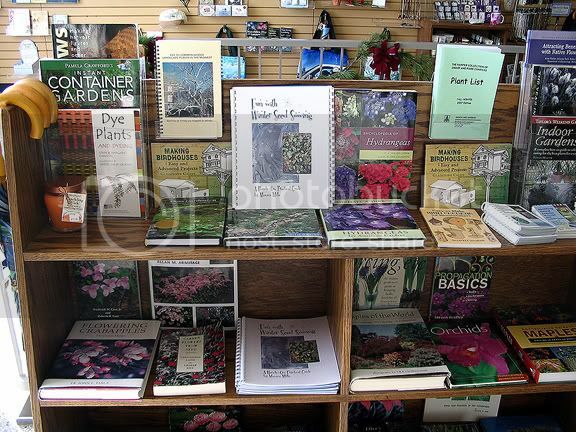 Isn't she pretty (center) at the Hidden Lake Gardens bookshop, despite the older cover? The new one makes it easier to read the title, while keeping the sense of fun. A booklet! How did I miss that. I want one and will now go figure out how to order it! Thanks for you interest. You can order the booklet from http://thegardenfaerie.com/print.html.